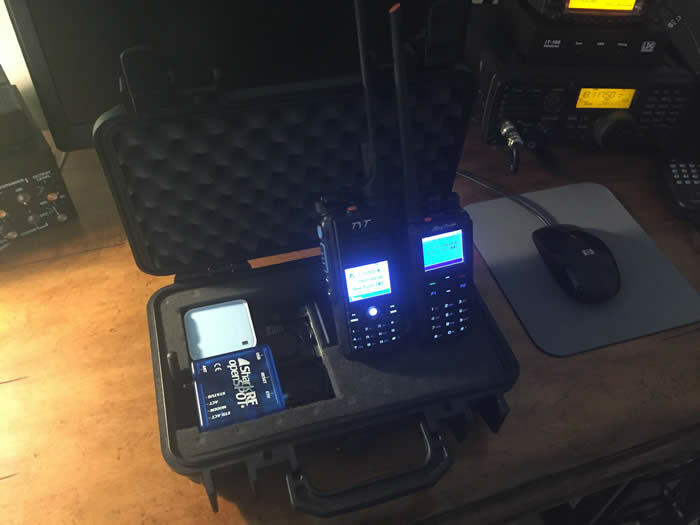 in conjunction with a cellphone as the "Hotspot"
Now that DMR is taking it's place among the newest digital modes, why not take your handheld with you as you travel and not be reliant on your local DMR repeater. With this article, you can construct a travel Go-box that will allow you to stay in touch with your friends back home and around the world! Consisting of a few easily obtained items from Amazon and easily assembled, you'll be on the air wherever you travel. After researching many interesting approaches, I settled on the design seen below. It along with my iPhone as a "hotspot" provide excellent communications. Construction is straightforward. Place your components in the case however you desire. There are a lot of different styles, amperage levels and physical sizes for the power packs so select one that fits your needs. I chose the Rav Power model because of good reviews. Once constructed, you'll need to configure the Shark Openspot, TP-Link Router and enable the "hotspot" on your phone. An example "codeplug" for MD380/390 radios that works well with this system is available here. Once configured and up and running, you'll be surprised as to how well this system works! Good luck with your "Go-Box!"